The Gruffalo was playing at The Lowry in Manchester over the holidays. We were invited to a press performance but were unable to attend due to other commitments. That wasn’t about to stop us watching The Gruffalo Live. I went and bought tickets for the show as a Christmas treat. Twixmas is a notoriously difficult time for the best of us. All the hype and hoopla around Christmas has fizzled out, and New Year’s Eve is still a while away. Pyjama days seem to be the norm and it takes effort to get anything done. It was during this week that we went to watch The Gruffalo; it gave us something exciting to look forward to after the buzz of Christmas day. Like with The Gruffalo’s Child, Tall Stories have stayed true to Julia Donaldson’s much-loved book. The story is about a quick-witted and brave little mouse and how it outsmarts three wily predators and the Gruffalo. 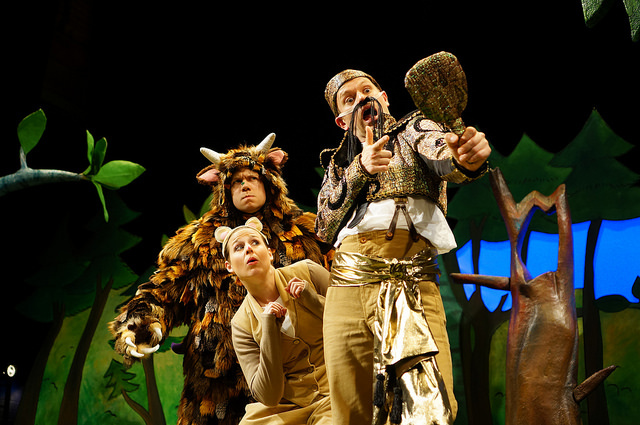 Three artists take on the role of the mouse, the story-teller, the Gruffalo, the fox, the owl and the snake. Each character has an individuality that comes out through song and dance. There are histrionics, gags and audience participation, giving the performance something of a panto feel – perfect for this time of year. My 6 year old may have moved on from The Gruffalo to ‘big chapter books’, but there was enough in the live show to keep him giggling from start to finish. He enjoyed it and I enjoyed watching him have a good time. The show runs for 55 minutes without an interval. 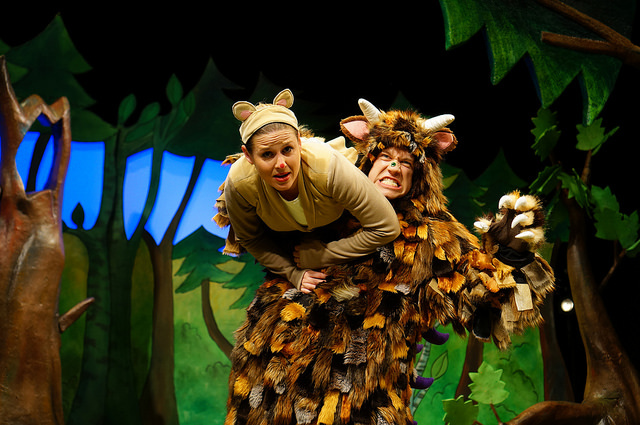 It is recommended for ages 3 and above, though age really is no bar for fans of The Gruffalo! The Lowry houses three theatres – The Lyric, The Quays and The Studio. Each has different seating arrangements and entrances. Your tickets should tell you which door to go to. A push-chair parking facility is available for most children’s shows. The Lowry is home to a permanent exhibition showcasing the work of L.S. Lowry. The exhibition is free and open to all. Pre-theatre dining is available at the Pier Eight Restaurant and Bar. Kids eat free (one free course per one adult paid course) when there is a children’s performance in any of the Lowry theatres. Parking is available in the Lowry Outlet shopping centre located across from the theatre. You can either buy prepaid car parking with your theatre tickets (£6) or pay at one of the kiosks on your way out. The Lowry is easily accessible on the tram network. The Media City tram stop is only a short walk away. Do you enjoy live theatre? What is your favourite show? Let me know in the comments below.